So when we knew we were going to Hawaii for Randy’s cousin’s wedding, we were thrilled at the prospect of snorkeling again. We were hopeful that Zoe would be able to share the experience. On our second day on Oahu we went to Snorkel Bob’s to rent gear for all of us. We tried on masks and flippers and listened to instructions and looked at maps. 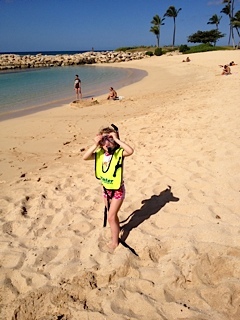 Zoe expressed a little fear about snorkeling for the first time, but she was definitely willing to try. And she did. At least three or four times. I think she kept her face in the water for about five seconds at a time. She didn’t really get anywhere. She said she saw one fish and some coral. But she tried day after day, time after time, to figure it out and push herself. She mentioned several times how glad she was that she tried snorkeling. So she didn’t really experience the multitudes of beautiful fish that we saw hundreds of feet off shore. But she tried something new, and kept trying, which you have to admire.